Joel Clymer – The Barristers’ Association of Philadelphia, Inc.
Joel Clymer focuses his practice primarily on commercial litigation and labor relations and employment law. He has experience litigating employment discrimination cases from filing through to trial, and has filed, argued, and prevailed on multiple dispositive motions. He also has experience defending clients in State Appellate Court matters. Previously, Clymer served as Deputy Attorney General at the New Jersey Office of the Attorney General, Department of Law and Public Safety, Division of Law. He has also represented agencies in trial and appellate courts in State and federal court systems and in administrative hearings before the Office of Administrative Law. 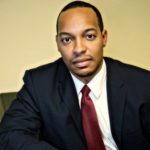 Prior to his position at the New Jersey Office of the Attorney general, Clymer clerked in the Superior Court of New Jersey for The Honorable M. Christine Allen-Jackson, J.S.C. During law school, he served as President of the Black Law Students Association and was an inaugural recipient of the Archer & Greiner Diversity Scholarship Program. Clymer also volunteered with Temple Legal Aid, advising and assisting indigent and terminally ill clients in Social Security Disability hearings. He has also served the West Philadelphia community as an AmeriCorps State and National Volunteer.